First Impression Ooohh... A good looking bomberman clone! Look at the cool graphics and the bombs exploding. Hey! This is pretty fun! What It's Like You're Bombman. 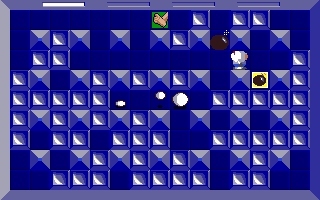 Depending on what game you choose, you either want to destroy all the blocks on the screen with your bombs or kill the evil bomberman. You can play against someone else, or the computer! Really good graphics! Cool animation! This game is just plain neat! Other things you should know Up to four players! You can also collect many powerups and play with different modes. There are different tile sets, and other cool things. This is a very good program! Graphics Great graphics! Just look at the images on this page! They look very good! Sound Okay sound. It's internal speaker music. Whenver you place a bomb it goes tick and whenever you pick up a powerup, it goes blip. That's it. It's not bad, though, and it doesn't get annoying. Gameplay/Control This has very complex gameplay. It's set up for up to four players, and works out great. 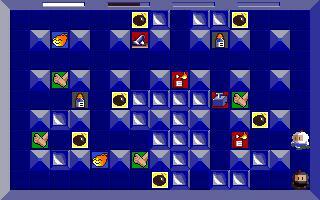 On all of them, only four keys for arrows are used and one key to drop a bomb. 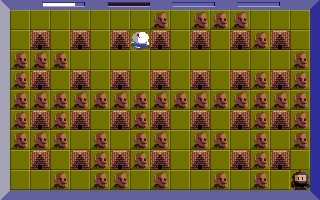 Plot/Story A bomberman clone with a story!?!? Yeah right. Overall Impression I really like this game! It's got great replay value and is very fun! I just played it for about 45 minutes before I started this review! Excellent graphics!